Since they took over control of the New York Giants in 2006 from their fathers, John Mara and Steve Tisch have presided over 33 percent growth in the value of their team – best in the NFL. The 2010 opening of MetLife Stadium helped them rack up a 21 percent bump in revenue last year, the latest achievement for an ownership duo that also lifted the Lombardi Trophy in 2007 for the organization’s third Super Bowl victory. Based on their team’s performance on the field and financial growth off of it, the Mara and Tisch families are the best owners in the NFL, by Forbes’ estimation. To come up with our list, we looked at teams’ change in franchise value and win percentages (including a bump for playoff and Super Bowl victories) over the last five years. Each factor accounts for half of their rank. Close behind in second place is New England Patriots owner Robert Kraft, whose team has racked up the highest winning percentage in the NFL over the last five years. New England’s gate receipts were second-highest in the NFL in 2010 at $93 million, and by Forbes’ appraisal, the team’s value has increased 17% over the past five years. In third place: James Irsay. His Indianapolis Colts have appeared in two Super Bowls in the last five seasons, but the Colts’ new stadium deal is just as successful as the product on the field. The team pays just $250,000 a year in rent on the three-year-old Lucas Oil Stadium, while the city of Indianapolis covers all operating and maintenance expenses. The deal allows Irsay to keep one of the lowest debt percentages in the league. The fourth spot goes to the Green Bay Packers owners, who happen to be over 100,000 shareholders. The Packers, winners of the most recent Super Bowl, are the only publicly-owned major sports team in the United States. The franchise is based in by far the smallest NFL city, but still has one of the highest brand management values in the league at $85 million. The team’s value has risen 17% over the past five years. Infamous Dallas Cowboys owner Jerry Jones comes in at number five. Despite no recent postseason success, the Cowboys opened a $1.3 billion new stadium in 2010 – the most expensive ever. The iconic blue star represents the most valuable team in American sports, a title the Cowboys hold over the New York Yankees. The average NFL franchise has grown 8 percent in total team value over the last five years , something you certainly can’t say about the stock market. But some teams have actually been losing value during this football boom time. The worst NFL owner by our estimation is William Clay Ford Sr. of the Detroit Lions, who’s known for both losing seasons and losing money. Not only did the Lions post the first 0-16 season in NFL history in 2008, the value of the franchise dropped 3 percent over the last five years. Detroit was also the only team in the NFL to lose money in 2010. Honestly, simply keeping Millen around as long as he did (and giving him extensions), should land Ford at #32. That was just his latest screw up. The previous administration was really not that much better. 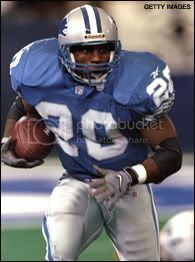 If not for Barry Sanders, the team would have been an unmitigated disaster for years before. Only once WCF, Jr. started to come into prominence did the old man start spending some money. 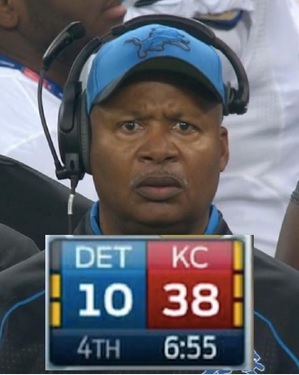 This season should see a significant gain for the Lions market value. With Stafford healthy (*knocking on wood*) and Suh getting even more noteriety (both good and bad) the slide should stop and reverse itself. And so far every game but the first pre-season game against Cincy has been sold out. If I'm not mistaken, the Carolina game is close, Turkey Day has long been sold out, and I'd be shocked if the Minnesota game didn't sell out. Beyond that, there's only the San Diego game. I wonder what the Lions get if they create a draw at other stadiums? For instance, how much do they get if their game in Chicago sells out? Last edited by m2karateman on November 5th, 2011, 11:43 am, edited 1 time in total. I would bet they are making a killing on merchandise this year as well.. you see alot of people sporting new lions gear this year all over the state..
i got a hat, t-shirt, and complete #90 Suh toddler jersey and matching sweats for my son, and a complete lions cheerleader outfit for my daughter..
so as you can see, we made up for our deficit of game day gear all in one shot..
and its a good guess that my family is not alone in doing this. How long have we been bitching about WCF and his ownership? Its fair to make this assumption that he's one of the worst owners in the league. You have to wonder if Mayhew and Lewand were his choice of Bill Ford's. Either way, it will take a few years worth of winning and a playoff appearance/run until he'll be moving up the rankings. Unfortunately, he looks like Monty Burns and may not be around long enough to see it. Given that it took Ford 46 years to find a decent GM and coach, I think the criticism is more than fair. durring the Barry Era the Lions REFUSED to draft Linemen...rumor has it it was due to the old man. Joey Harrington. Was all the old man. Be careful what you wish for.....Millen's hiring was the advice the old man got from Junior. Senior extended him, but Junior was the one who recommended Millen in the first place. So, better late than never is what you are saying. I would rather have an owner that makes sound business choices in the first place. I realize that. But the fact is that neither of the Ford's are people with what I would call high football intelligence. It's nice that junior was so willing to admit his mistake and wanted Millen gone. I want an owner who has just a little more emotional ties to the team than what the Ford's seem to have to this team. In my eyes, this team is a playtoy for them, not a serious business. if that were true why would they put in over $200 million for ford field and $35 million for the practice facilities and headquarters in Allen Park? I agree that they probably dont know football all that well but I think they care about the team more than you think. Ask yourself....why did the Lions leave the Silverdome? Was it simply because they wanted to move the team into Detroit? The answer is no. The reason is money. The Pontiac Stadium Authority refused (STUPIDLY) to change the terms of the contract they had with the team. The PSA owned the stadium, owned the parking around it, and basically owned the concession rights. The set up the team had with them was antiquated and costing them money. For the Lions to make money, that stadium basically needed to be filled to capacity for just about every game of the season. 88,000 seats, or something like that. The Lions were paying $3M per year for the lease, and were getting percentages on the ticket sales (less than half per seat), and on the parking in the stadium lot. They got, from what I understand, nothing from concession sales...or a very small amount of the percentage. That is why the Lions left Pontiac. They were getting royally screwed over based on the terms of their deal, but it was about money that Ford Field got built and why the team moved there. Make no mistakes about that. WCF was tired of the team losing money because they couldn't sell out the stadium, and he wasn't getting local TV money when they would get blacked out. As for the practice facility.....same thing. Yes, they put together a great stadium and great facility. But it was costing them money to use other fields and facilities for the team to practice. You think Oakland University let them use their fields and facilities for free? Not really. I'm sorry, but my opinion of the Fords stems from decades of watching them be uber cheap during the pre-salary cap era, destroying the will to play of the greatest RB this game has ever seen, and his blind loyalty to the worst GM in sports history. I think the evidence is pretty strong in my favor. you cant have it both ways pal - if its not a "serious business" than why would they care so much about losing some money at the Silverdome. they ve also lost money at ford field and they didnt need to spend 235 million for that to happen.